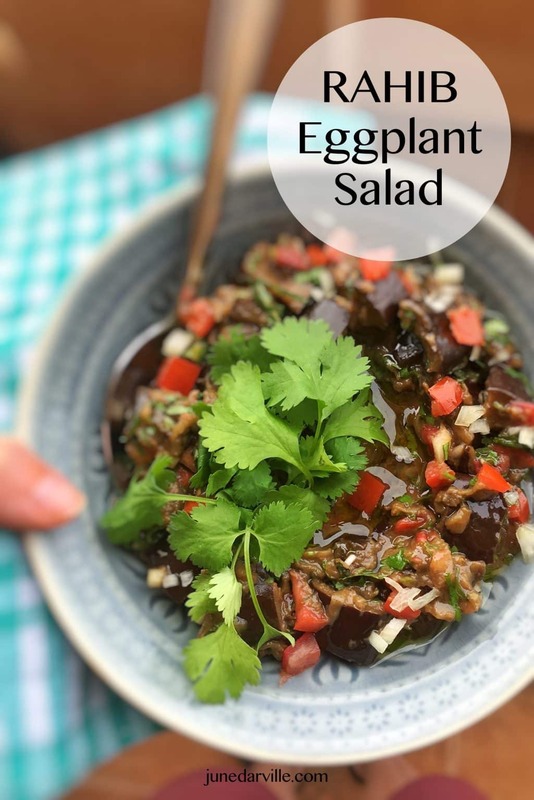 Rahib Salad (Roasted Eggplant Salad) | Simple. Tasty. Good. Ever heard of a rahib salad or salatet el raheb then? I ran into this delicious cold roasted vegetable salad while we were on a last minute vacation at the Hyatt resort in Taba, Egypt. The hotel wasn’t even half full but the kitchen staff still did a pretty good effort to provide a fresh and varied buffet choice anyway. This salad was always part of the lunch buffet. I truly love it because I see it as a delicious alternative for the classic eggplant baba ganoush you also know well. 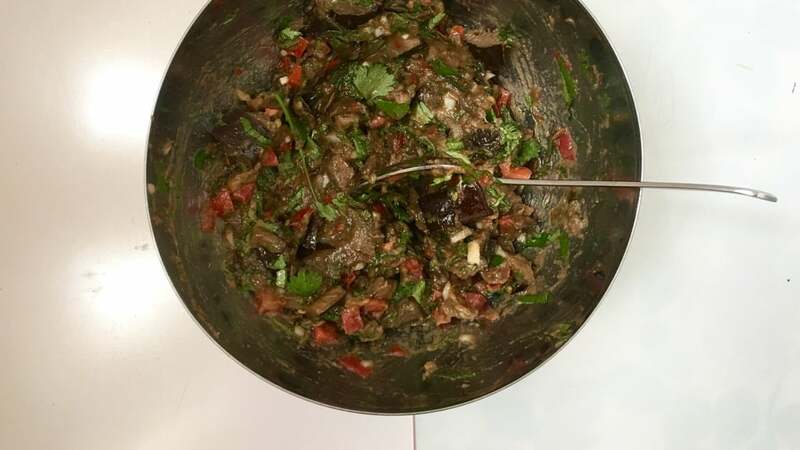 Roasted eggplant is also a main ingredient here but instead of blending it all into a smooth paste you just chop up the eggplant and then add freshly chopped tomato, mint, cilantro and also onions. Some recipes also add red and green bell peppers. Just don’t forget the lemon juice. That’s the finishing touch for this rahib salad. 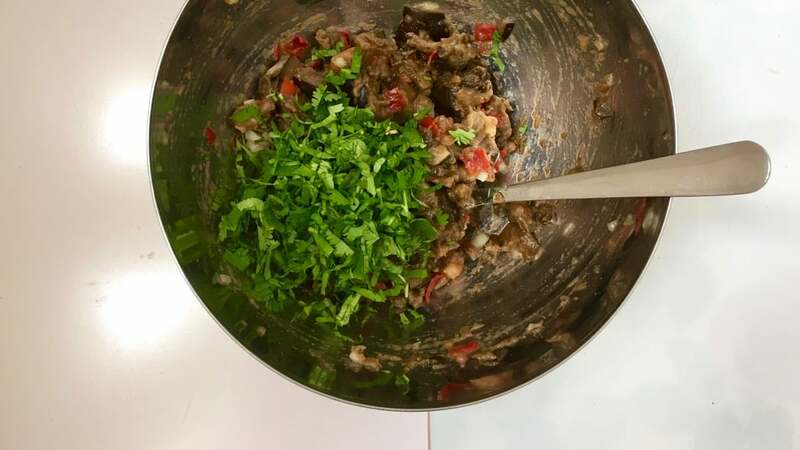 Fresh and easy rahib salad: an Eastern roasted eggplant salad and also a great alternative for the classic baba ganoush! Wrap the eggplant in tinfoil and place it on an oven rack. 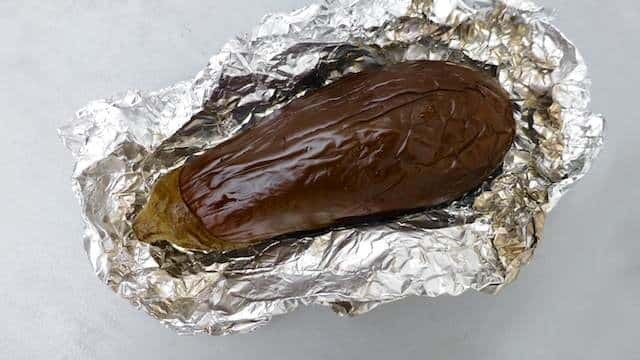 Roast the eggplant in a preheated oven at 400°F (200°C) for 45 minutes. Once done, turn the oven off but let the eggplant inside for another 45 minutes until it's super smooth soft. 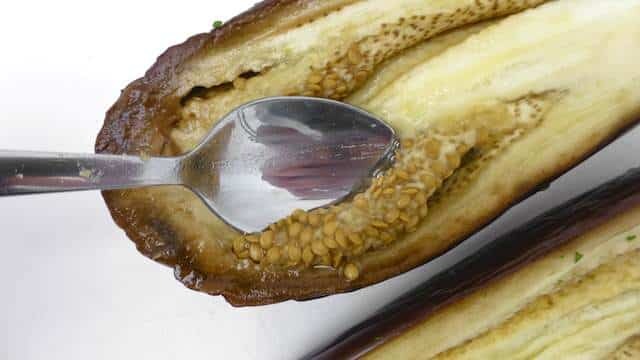 Remove the tinfoil and slice the soft eggplant in half lengthwise. Remove any tough seeds on the inside if necessary and discard them. 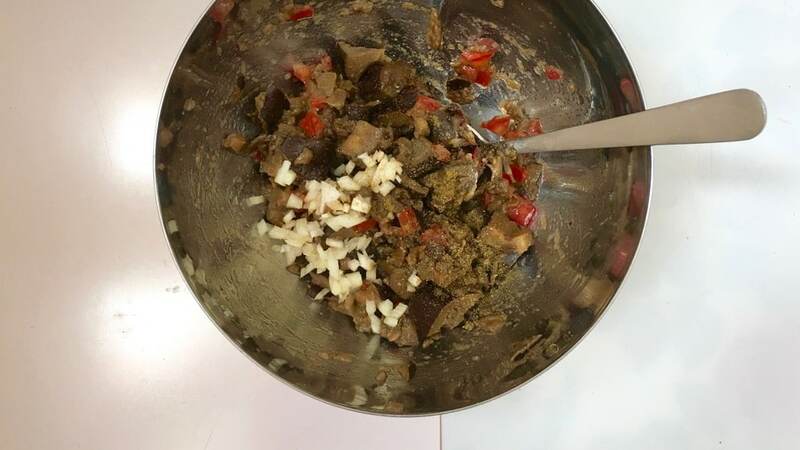 Then dice the eggplant up finely and add it to a bowl. 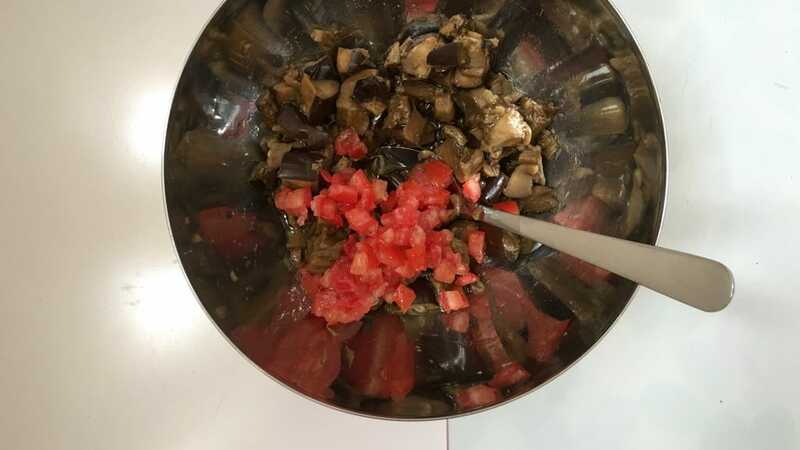 Also dice the tomato finely and add it to the eggplant. Give it a good stir. Add the chopped onion, lemon juice (or vinegar), ground coriander and ground cumin. Season with a pinch of pepper, salt and garlic powder. Stir well again. Drizzle with the olive oil. Also add the caster sugar and chopped cilantro and mint. Stir the rahib salad well. Keep it somewhere between mushy and chunky. Then check the seasoning and add extra pepper, salt, garlic powder, cumin, coriander or lemon juice to taste. Put the rahib salad in the fridge for another 15 minutes to chill. Serve with tortilla crisps, crackers or pita bread.